I hope everyone had a great Christmas and good break from work. I had an excellent time in Hong Kong – short post on my trip to follow. So how did I do in December? Of course, I hadn’t intended to save so much, going overdrawn in the process as I’d forgotten to change my automatic savings amount. The amount saved was boosted by £100 rent received. No extra bits from online activities as I’ve been too busy doing other stuff but hopefully, ‘normal’ business will resume in the new year! 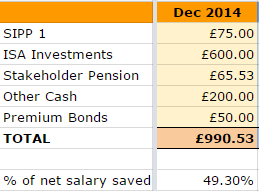 Average savings for 2014 was therefore 46.5% – missed my target of 50% but a great first attempt, even if I say so myself! After reading Tim Hale’s ‘Smarter Investing‘, I created my Portfolio For All Seasons and also made the decision to “include my shares under the ‘Domestic Equity’ bracket”, even though Hale only talks about funds. However, I think I will now separate my shares from the rest of my investment portfolio, so that I follow Hale’s philosophy a little more closely with just funds (tracking the value of my funds) and my dividend investing ‘philosophy’ with my shares (tracking the dividend income). Still need to shift some more from the UK sector into global/world and then I’m pretty much there. I will then just try to keep those allocations relatively the same for the next few years. I added more GlaxoSmithKline shares to my portfolio and bought a few in BHP Billiton. Sounds like I was jumping on the bandwagon with the latter as everyone seemed to be buying into mining shares but I did have this purchase set up as a regular payment at the end of November ready for the December purchase. Dividend income this month came from Tesco (£1.39) and BP (£4.40). So my total dividend income from shares for 2014 is £9.30. I think I can confidently say that I should be able to beat that next year! Will be looking to add some more over the coming months. My Future Fund now stands at £43,001.78, which is 17.2% of my overall target. Still a long way to go but I’m happy with the progress I’ve made so far. 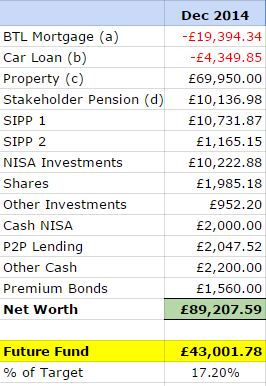 My net worth has increased by £5,782.30 since my last update in September, which is around a 7% increase. I don’t put a huge onus on my net worth but do track it as it seems to be something that other bloggers are interested in, so I just update quarterly to keep tabs on it. I’ve joined Moneystepper’s 2015 Savings Challenge, which includes an annual goal around net worth – not a lot of extra work required on my part so I’ll just see how that goes. 19% was spent on meat or fish and 27% was spent on fruit and veg. 16% on snacks so I guess I’m getting my fill in before the diet starts! So that’s pretty much it for this year – I would never have imagined how important 2014 would be for me financially, that my eyes would be opened to what can be achieved if you only had a plan and some focus; that I would ‘see the light’ and make a plan to save for my own financial independence. Thanks to all who have taken the time to read and to post comments on here – all very much appreciated, thank you! This entry was posted in Dividend Investing, Expenses, Funds, Net Worth, Savings, Shares by weenie. Bookmark the permalink. Congratulations to you and all the best for 2015, you're gonna rock it!!! btw I'm envious of how well you're managing to re-balance towards the asset allocation you're working to. I think splitting out your stocks from your funds makes a lot of sense. I have a similar problem with my pensions and Isa. If I lump them all together the asset allocation gets skewed as they are meant to do very different jobs and have very different risk profiles. In future I may record the allocations separately as you have done – thanks for the tip. Hi MP, thanks and all the best for you in 2015 too! Hi Cerridwen, yes, I am both pleased and a little surprised at how well 2014 has gone. I never thought that I'd be able to save like this. With regards to the re-balancing, reading the Tim Hale book really helped me, in particular taking the emotion out of things, otherwise I would have been too 'loyal' with some funds that I needed to switch. Your plan and target is very well defined as you say and I wish you all the best in 2015 with it and look forward to reading your updates and successes! Great 2014 by the sounds of it weenie! You are tracking everything very closely, I like your style. Hi TFS, yes, it was a great 2014! And the 16% on snacks will hopefully be less next year! All the best to you in 2015 too! You jumped two positions in our net worth tracker – woo!